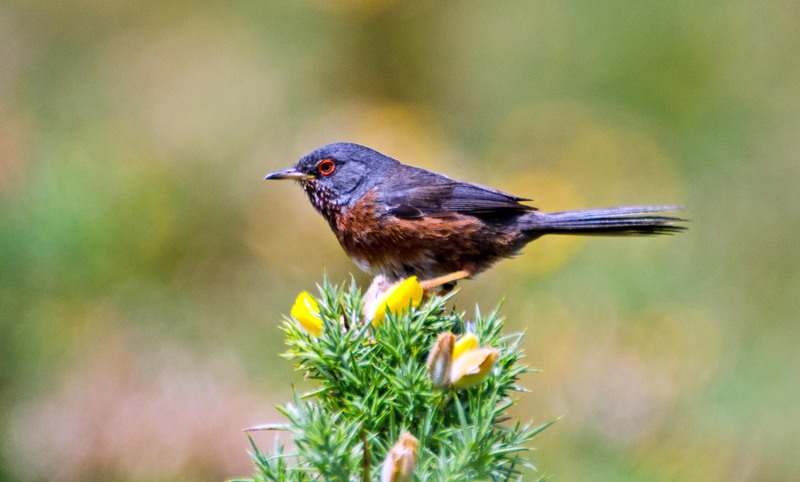 Unlike the UK, where there are only a few thousand pairs of Dartford Warblers – mainly in southern England (1) – this species is quite common on the Iberian peninsula, albeit locally. There are may be as many as 3 million pairs in Spain, and 100,000 in Portugal, although worryingly, overall populations have declined significantly in recent years (1998-2012) (2). 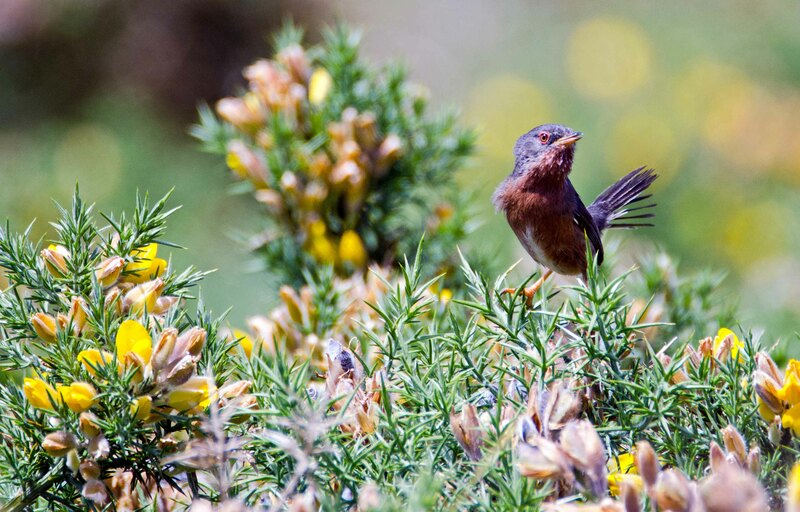 This species also occurs in France, Italy and north Africa, but its stronghold is in Spain, where it typical occurs in low scrub land (<1.5 m tall) composed of plants species such as Ulex, Erica, Rosmarinus, Genista, Cistus and Quercus coccifera (3). For me, it is typical of gorse heaths near the coast in Galicia. 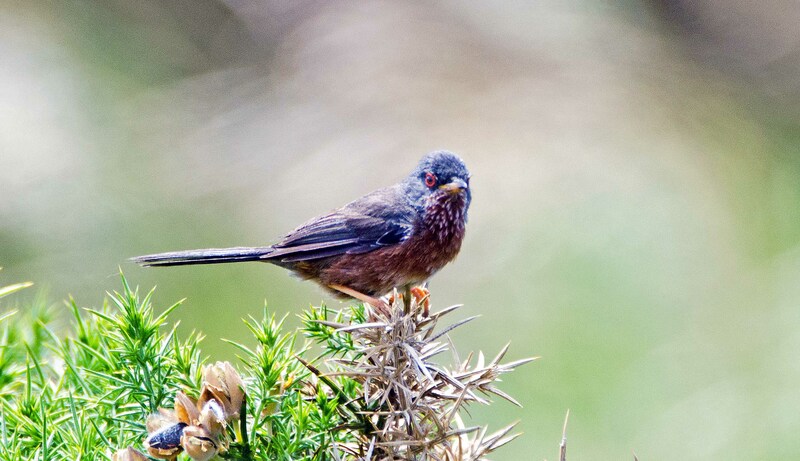 There are three subspecies of Dartford Warbler, and all occur on the Iberian Peninsula (4). 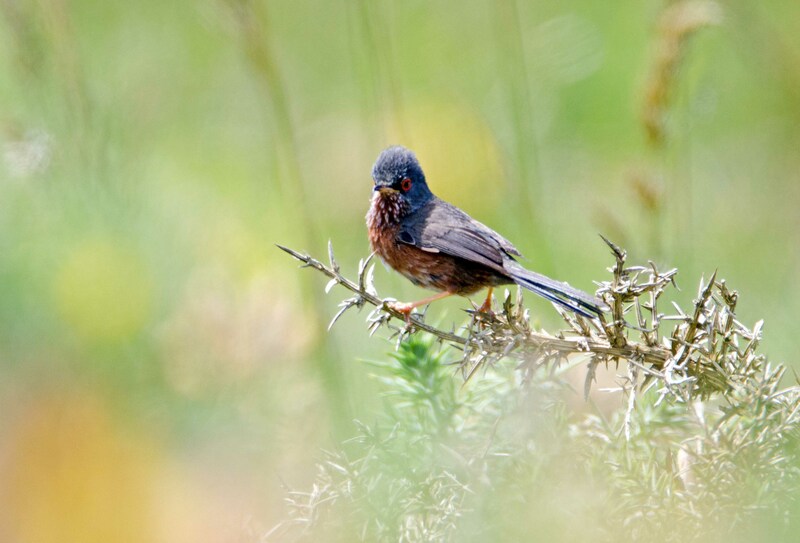 The so-called nominate race – Sylvia undata undata – is a common resident in most of mainland Spain, but it is joined in coastal northern and northwest Spain by both residents and migrants of the race found in Britain and France: Sylvia undata dartfordiensis. The more northern S. u. dartfordiensis birds and browner above (on the mantle and scapulars) and a deeper red-brown below, than their southern cousins which are solid grey above (4). Identification problems can arise however, because in reality there is a north-south cline (or gradient) in terms of the birds plumage; in other words they grade into each other. According to the authoritative Helm guide, ‘there is insufficient material [meaning collected specimens in museums which can be examined] to draw firm conclusions concerning populations …in NW Spain”. Additionally, because of the harsh conditions along the Atlantic coast – which can result in local extinctions – recolonization can may be by birds from different locations, producing ‘a mixture of plumage characteristics’ (4). So what are the birds here then? There were all from the same area, on or close to a headland in northern Galicia called Punta Corveira – between the towns of Cedeira and Valdoviño. To be honest I am not sure. In some photographs (e.g. above) the birds do appear to have faint, brownish suffusion of colour to the grey upper parts, but whether this is enough to classify them as S. u. dartfordiensis birds, I don’t know. Perhaps someone can comment? Anyway, whatever they are, I like them! I like the way Dartford Warblers pop up for a few seconds, scan the horizon, give a short song, and then disappear again. I like the way they perch and posture! I love their colouration; so stylish: grey and wine red with a polka-dot cravat! What goes on down below in the shrubbery! Mating, nesting and foraging presumably. But we never see this hidden warbler world! Finally, the name is a bit daft given that – as far as I am aware – there are no longer any of these birds in Dartford! Perhaps we should call them by their Spanish name, since most of them are Spanish! Curruca rabilarga. 1. Wotton, Simon, et al. 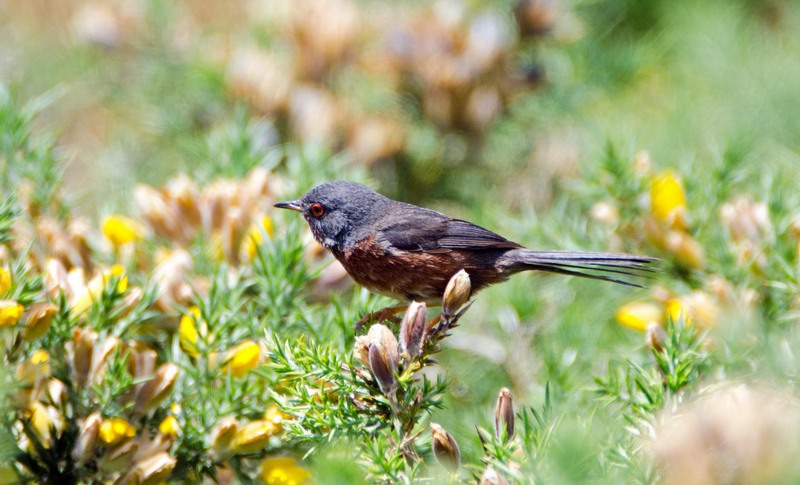 “The status of the Dartford Warbler in the UK and the Channel Islands in 2006.” British Birds 102.5 (2009): 230. 4. Shirihai, Hadoram, Gabriel Gargallo, and Andreas J. Helbig. Sylvia warblers: identification, taxonomy and phylogeny of the genus Sylvia. A&C Black, 2001. Next Next post: Water pipits like watercress!